As one or two others might have noted: If Grave Mercy was a more historical and political story, and Dark Triumph was a darker, self-journey, then Mortal Heart is definitely a more fleshed-out high fantasy adventure. Annith's story takes us slightly back in the series' timeline and then moves forward, showing us a few things about the Convent of St. Mortain that we didn't already know, some strange behavior from the beloved Reverend Mother, the abbess (whom I finally learn has a name, Sister Etienne), that doesn't surprise anyone already familiar with the fact that said abbess is hiding something, and onto a journey to discovering more about this wonderfully crafted world of old gods and intriguing magics and powers that the other two books had not really shown us before. As a side note, Mortal Heart is a little heavier in content of religion, depicting what I understand as the people slowly accepting Christianity, converting from their worship of the old pagan gods. Or something like that of which I may have to do some research on to really understand. According to the author herself, while the gods in His Fair Assassin were her own creation, she based them off of "historical, geographical, and theological precedents." 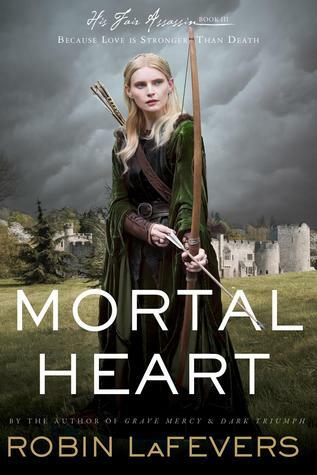 Mortal Heart is a conflicting book for me to rate and review, if only because, while I enjoyed it a lot, I also found myself a little wary of the way in which LaFevers interweaves history with her fictional creation. I'm not naive; I understand, and am sure, that our lovely author has taken all the liberties she needs to make the book flow to her heart's desire. How accurate to historical events this series has been was not really my main nitpick. Instead, it was the way in which she presents her interweaving of her fictional His Fair Assassin world with said historical events that feels a little awkward to me. Truth be told, the presentation of the first two books was slightly less jarring than the ending events of Mortal Heart. And Mortal Heart was actually doing reading quite well until the ending. In a sense, the way in which these events are presented almost feel "dropped" into the flow of the story through the latter half of Mortal Heart--events involving the Duchy of Brittany, the Duchess Anne, her eventual betrothal to the French King by the end of the book (is it a spoiler if this happened in history?). There was a feeling of awkward outlining, and maybe some deliberateness in how the fictional story aligned with the factual, historical aspects. I'm not an expert in the history of Brittany, but even I felt that some of the interweaving of the magic into historical facts felt a little awkward, and required a slight necessity for forced suspension of disbelief. Of course, I'm not saying that this jarring from the fictional story took away too much from my enjoyment of Mortal Heart. Because if I'm honest with myself, this was an extremely enjoyable book, and the series so far has been very satisfying. As an aside, I would be more interested in learning about this time frame--that LaFevers notes is more Middle Ages than Renaissance--and all the actual historical facts that occurred during the Duchess Anne's life and her struggle with France to maintain Brittany's independence, as a frame of reference, though. Mortain's helliquins are lost souls seeking redemption for the wrongs they have committed during their life. For as long as it will be necessary, these helliquins are left to wander the nights, riding the lands in search of other lost souls who are in need of guiding towards the after world. This is how a helliquin seeks its redemption. Annith was brought to the Convent of St. Mortain as a baby and has no knowledge or memory of what her life was like before the convent. Unlike many of the other girls, she did not experience any kind of tragedy of needing to run away from any controlling men, or desolate life in poverty. And unlike the other girls, she was not gifted with a special skill, given by Mortain so that she may better serve him. Even so, she has dedicated her entire life to serving the God of Death she so loves, to one day become the killing instrument for Mortain she has trained so hard for since she was a child. But it seems that the Reverend Mother has other plans for her--plans she does not understand, nor do the other sisters in the convent seem to agree with. Instead of going out into the world and practicing her hard-earned skill, Annith is to take over for the convent's Seeress, to be forever locked up in an isolated room of the convent, never to set foot outside of it again. And even while Annith does what she can to change the abbess's mind, she starts to discover that many of her beloved Reverend Mother's actions are becoming more and more questionable. Listening in on private meetings that the abbess has with other sisters has started to pique Annith's distrust in many of these actions, and she is determined to find out what the highly revered abbess may be hiding. And so Annith embarks on her own unsanctioned quest to confront these questions, only to end up on an eye opening journey as she falls in with first Mortain's creatures of the night, as well as a band of St. Arduinna's own followers. And all the while the nation of Brittany continues to war and fall into turmoil. To get to the point, the thing I like the most about Mortal Heart was the further elaboration on the world of gods and saints only hinted at from the previous two books. I loved that we get to see the followers of St. Arduinna, shown their strengths and powers, and hear the story of how most end up becoming a follower of the Goddess of Love. Along that same vein, I also like that more of the "old gods" now turned saints are introduced, with their own magical components. I would like to see and meet more characters from each patron saint's following. I'm slightly wary of how Christian-themed the rest of the book ended up becoming, but I suppose it wasn't unexpected and actually worked out pretty well, since the converting of religions was said to be taking place (see above note)--the casting off of old gods, the forced introduction of One God, the recreation of the old gods into saints, the dwindling worship of the old gods... It was actually a pretty good transition in the background of the book. I absolutely loved the reunion between Ismae, Sybella, and Annith! I wish they could have gotten more together time to work together and play together before each were separated into their own new missions. While slightly dragged out, I actually DO kind of like the journey that Annith ends up embarking on before she finally reaches her destination, finding the abbess at Rennes and uniting with her sisters. While a little short-lived and abrupt, I really DID love the development Annith achieves throughout said journey, and wish that the journey and the adventure could have been drawn out just a little bit longer with more events. I like the newfound companionship she picks up with the helliquins and Balthazar. I also like the companionship she picks up with the small trio of Aruinna's followers. There was an open-ended conclusion that will lead wonderfully into the next two books most recently announced to be eventually written. I realize that I actually detailed a big chunk of my biggest issue with this book in my introductory paragraphs above. I will leave it at that, but will stress once more that, while it was an issue, it didn't necessarily take away from my enjoyment of the book as a whole. Annith's adventure was a great way to introduce more of the series' magical world, and a great way to develop Annith's character--but it felt too short a time, with too little events, and didn't exactly satisfy my suspension of disbelief concerning Annith's growth. Annith's big secret was kind of predictable, even if some other big secrets were not. In fact the secret surrounding Annith's birth was so obvious that I wasn't surprised by the reveal, even if I wasn't sure what the details of that secret would be. The thing that happens to Balthazar in the end feels kind of forced. Why are there two more books? And why will it take so long to get to them? 2018? 2019? I realize that this review was quite drawn out. I've written and rewritten several paragraphs because I'm having trouble figuring out what I want to say--not that it seems that way with all the words scattered in the above introductory paragraphs. But know that I've rewritten those paragraphs at least three times. It's why I was just going to list some likes and dislikes rather than try to be eloquent about it. But paragraphs happened anyway. So I'll have to live with this final product. My final thoughts about this series in general are positive ones. I look forward to the next two books LaFevers has announced, and any new developments she may come up with. I have loved the stories of the three girls, raised and trained together as sisters in the Convent of Saint Mortain. I have loved their individual stories, though I would also love a story where they are together. I would love to see more of the world created in His Fair Assassin. I am still conflicted on how I feel about the ending of Mortal Heart, as it feels like it would open up a whole can of difficulty in suspending disbelief. But it seems to smooth itself out quite well, and I'm curious to see how these events are managed in upcoming books, as I'm sure it will have to be addressed if the story is to continue for two more books. On a side note: As it stands, I really DO feel like Grave Mercy, and Ismae's story, is still my favorite of the trio. I know, I'm a dissenter, as I know many other seem to like the second or third book more--Sybella's story for the dark, emotional journey; or Annith's for the fantastical quest.